Attention:Now offering a 76-hour CHHA training course. Details below! BAYADA Assistive Care services in Bloomfield, NJ provide non-medical assistance with activities of daily living for adults and seniors when a health issue has made it difficult to manage everyday tasks on their own. 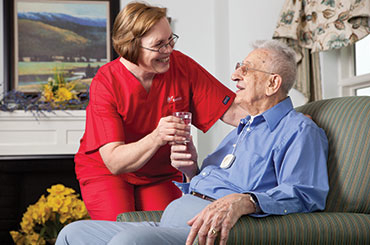 These services are provided primarily by home health aides on an ongoing shift (two-hour or more) basis, and are available 24 hours a day, 7 days a week. This care is also sometimes referred to as personal care or aide services. 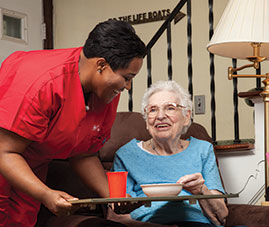 Our care professionals in Bloomfield, NJ excel at what they do, and their assistance can help adults and seniors continue living independently at home—where they want to be. Our assistive care specialists include BAYADA Home Health Aides, Certified Nursing Assistants, Homemakers, and Companions. Whether occasional services or live-in care is needed, we match the client’s needs with the right BAYADA professional. BECOME A CERTIFIED HOME HEALTH AIDE and complete your CHHA training in just 76 hours! Learn a new skill, break into healthcare, and come train with BAYADA to receive your official state of NJ CHHA Certification. Let us teach you in a warm, nurturing setting, with instructors that are registered nurses, approved by the NJ Board of Nursing. We offer classes in both English and Spanish, promises of employment, payment plans, and reimbursement/bonus programs upon completion of work. Our pricing is all-inclusive with no hidden fees and includes: 76 hours of classroom & clinical training, BON application fees, fingerprinting fees, textbooks, materials, and support with the online application process. Please fill out the form above or call us for more information.